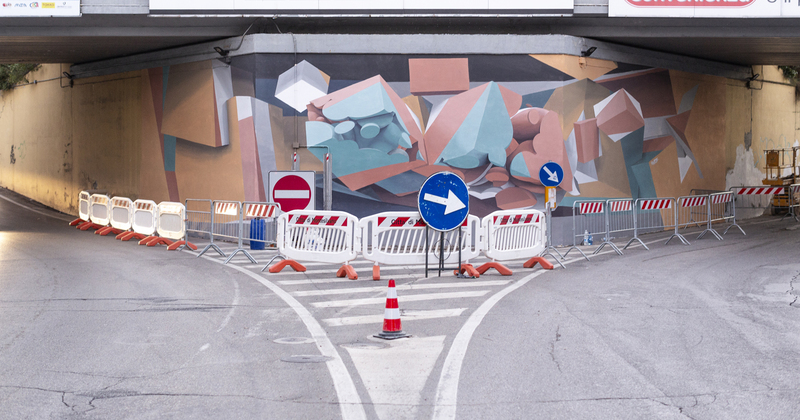 Montesilvano, Italy: new mural by Manuel di Rita aka Peeta for a project curated by Pepe Collettivo and Montesilvano City Hall. Parallelepipeds and spheres in warm hue meet and cross in an explotion which generates caos in the urban caos of trains, cars, bicycles and pedestrian paths. No anamorphic effects this time, but just tricks of perception – twisting and shaping the three surfaces. Once again the artist from Venice tells about the relativity of perception by colours and shapes evoquing baeches, seaside and sunsets as peculiarities of the area.